Home »Photography»Canon PIXMA Pro9000 Mark II only $50 at B&H Photo! Canon PIXMA Pro9000 Mark II only $50 at B&H Photo! Enter your email address in the pop-up box. It must be a real email address since B&H will email you the link for the offer. In this email from B&H, you will get a unique link for a new Canon PIXMA Pro9000 Mark II for $249.95. There is a $200 mail-in rebate from Canon which brings your final cost to $50! 4. 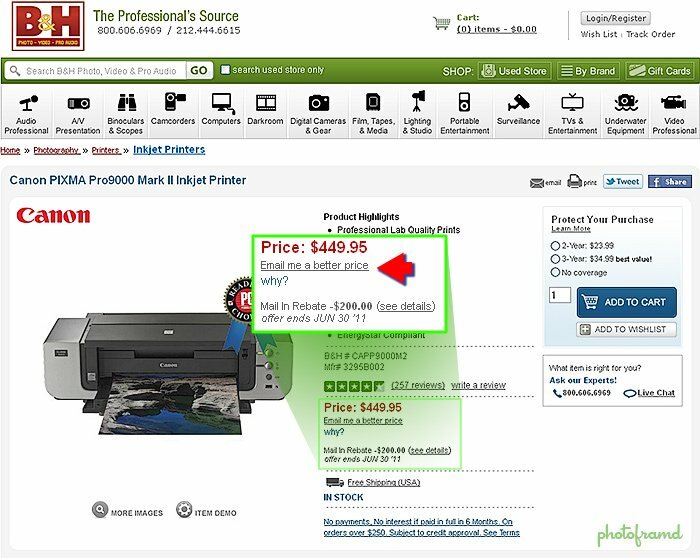 Follow the same steps to get a brand new Canon PIXMA Pro9500 for only $249 using this link http://tinyurl.com/3tpswx9. You will get an email from B&H with a unique link for $549.00 and there is a Canon mail-in rebate of $300. 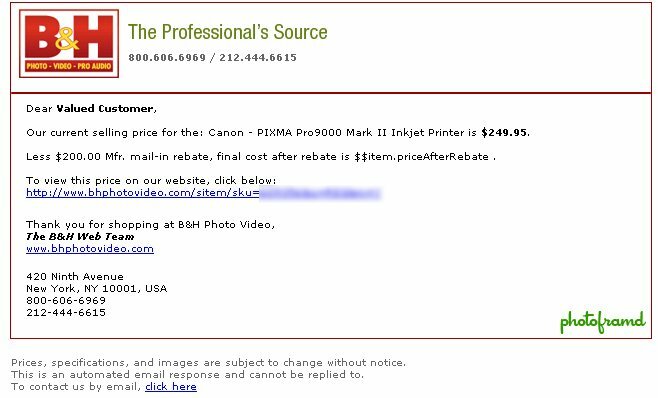 If you get this message after completing the checkout, CALL the B&H Mail Order number at (800) 606-6969 and say that you want the special price of $249 for the new Canon PIXMA Pro9000. The Canon PIXMA Pro9500 is still in stock for $549 with a $300 mail-in rebate, but even that is selling fast! You can backorder the PIXMA Pro9000 for $249.95, it will be availible in a couple of days.